A journey into the fascinating city of Busan and the surrounding area, visiting a magnificent Buddhist temple and a village of brightly coloured houses brought to life by Korean artists. We will have the opportunity to admire splendid views of the city and delve into two bustling markets, concluding our tour with an exquisite dinner. 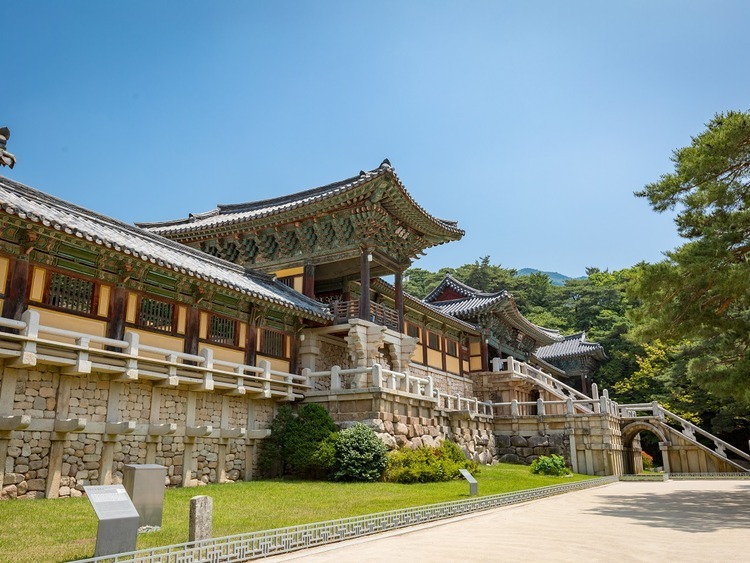 Leaving the port behind, we will travel to the forested slopes of Mount Geumjeongsan to reach our first destination: the Beomeosa Buddhist Temple, a magnificent building commissioned in 678 by Uisang, an important Korean Buddhist monk. We will pass through the temple's impressive gateways located at various heights along the hillside, and ascend to admire the exquisite fusion of Korean and Japanese architecture unique to the site, finally reaching the main hall to marvel at its enchanting ceiling carved with intricate floral motifs. Our tour continues with a visit to the picturesque Gamcheon Culture Village, a collection of houses scattered across the foothills. Once a shanty town occupied by refugees during the Korean war, the settlement was handed over to a group of artists who have given new life to the maze of streets and courtyards to create a vibrant village of brightly coloured and evocative houses, gardens and roofs. Our next destination is Yongdusan park located atop the hill of the same name in the centre of Busan, where we will pause to admire splendid views of the port and its surroundings. * After capturing the landscape with our cameras, we will continue our journey at Jagalchi fish market, the largest market of its kind in South Korea where most of the vendors are women. We will stroll through the brightly coloured stalls, breathing in the strong aromas and peering into the simple wooden crates of mackerel, squid and whale meat stacked on the floor. We will then continue to the Gukje market, the largest traditional market in Busan. Once dedicated to refugees fleeing the Korean war who opened stalls and shops to earn a living, the market has since evolved into a vibrant, colourful and thriving centre that sells all manner of goods at very reasonable prices. We will conclude our intense journey of discovery of Busan and its charms with an exquisite dinner, discussing our experiences and toasting our wonderful host country.